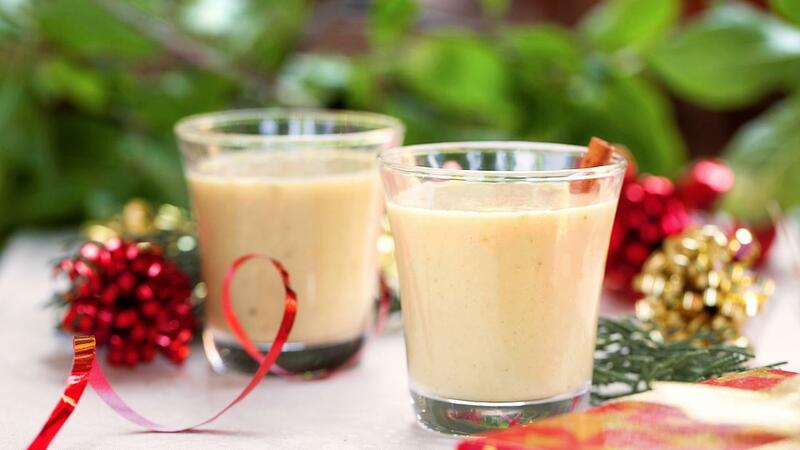 Growing up I remember that adults always drank this thing called “Egg Nog” during the holidays. I was never quite sure what it was, but it had a unique yellow hue and a wonderfully spicy smell. One time I snuck a sip of my mom’s and thought it was one of the most interesting things I’d ever tasted, second only to the rum balls I helped her make (and occasionally tasted). I have yet to veganize the rum balls, but the egg nog, I am definitely working on. Most vegan recipes use tofu to thicken their nog, and while I admit that it’s much less gross than the dozen raw egg yolks that are in traditional egg nog, the thought of drinking liquid tofu is still unappealing to me. 1. In a small saucepan, combine milk, sweetener, cinnamon, turmeric, nutmeg, and salt. Bring to a boil over medium heat. 2. Whisk in dissolved kuzu, and continue whisking for 2 minutes. Add vanilla and rum or brandy (if using). 3. Chill and serve cold, garnished with an extra sprinkle of nutmeg.